We invited the witnesses from our wedding to dinner a few weeks ago; we wanted to thank them for being there and supporting us. 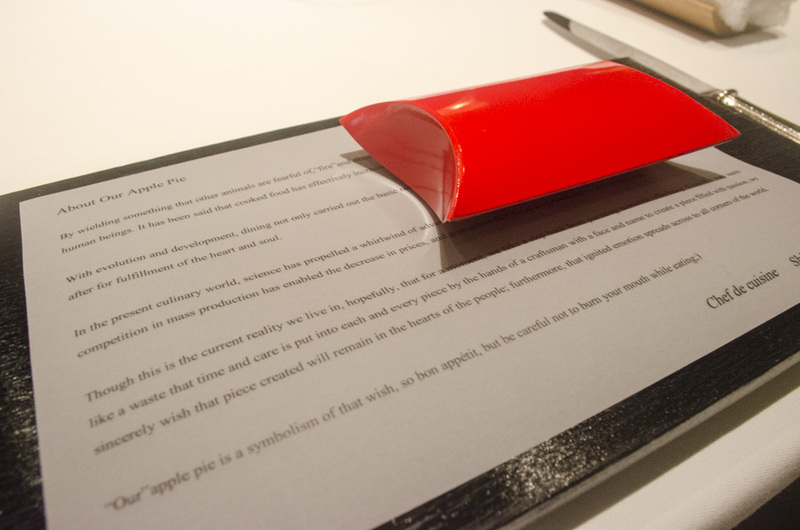 As a gift, we promised them a meal that would be not only delicious, but Michelin starred as well. I had to find a restaurant that would be unforgettable. So, what sets a restaurant apart? For me, a restaurant must accomplish two things: tell a story through their dishes and create an ambience that compliments that story. On top of that, I had to find a restaurant that would accommodate a vegetarian diet because one of our witnesses is vegetarian. 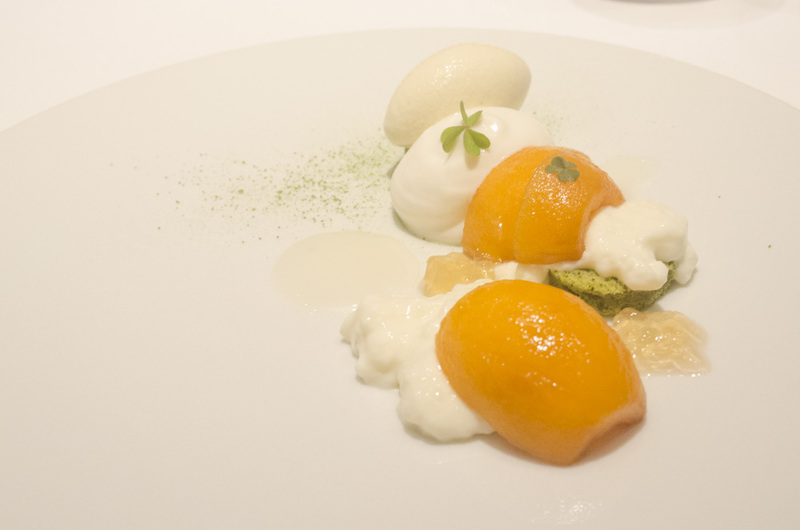 Luckily, everything is possible in Tokyo and French restaurant L’Effervescence offers it all. 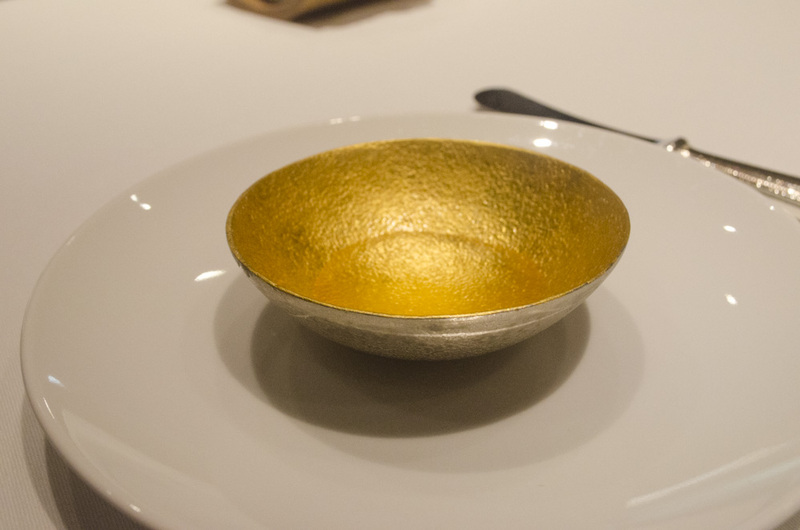 L’Effervescence is a two star restaurant in the Nishi-Azabu neighborhood. 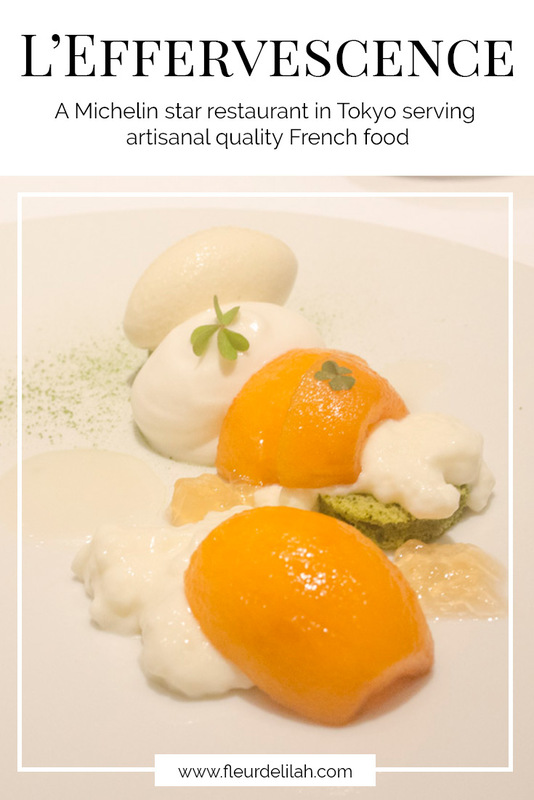 Established in 2010, the restaurant serves contemporary French cuisine by lauded Chef Shinobu Namae. 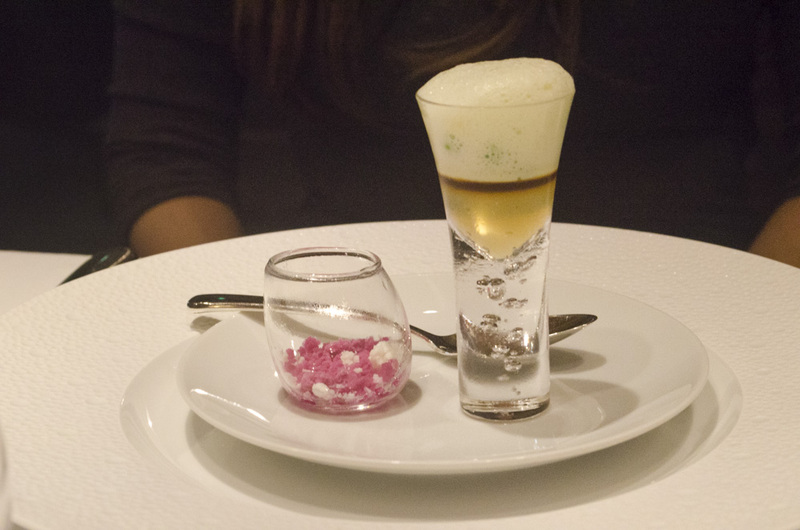 Prior to opening L’Effervescence, Namae honed his skills under Michelin star chef Michael Bras in Japan and France and worked at Michelin star restaurant The Fat Duck in England. Now in his own restaurant, along with a passionate team, he creates food that speaks for the environment and those who farm it. Located on a quiet backstreet, L’Effervescence is an oasis in an otherwise lively area of the city. The restaurant is nestled in between residences and is discreet, marked only by its name etched on an illuminated stone facade. Lined with lush plants, a pathway to the left of the sign leads up to the entrance. Beside the entrance is a tree stump. Normally considered an eyesore, L’Effervescence chooses to light it and, in doing so, brings attention to its beauty. Inside, an abundant respect for nature is evident in the restaurant’s design. Natural materials like wood and stone create unobtrusive lines to a wall of floor-to-ceiling windows looking onto a private garden. Around the room, crisp white table clothes and fresh flowers dress the tables. The atmosphere is calm and airy. 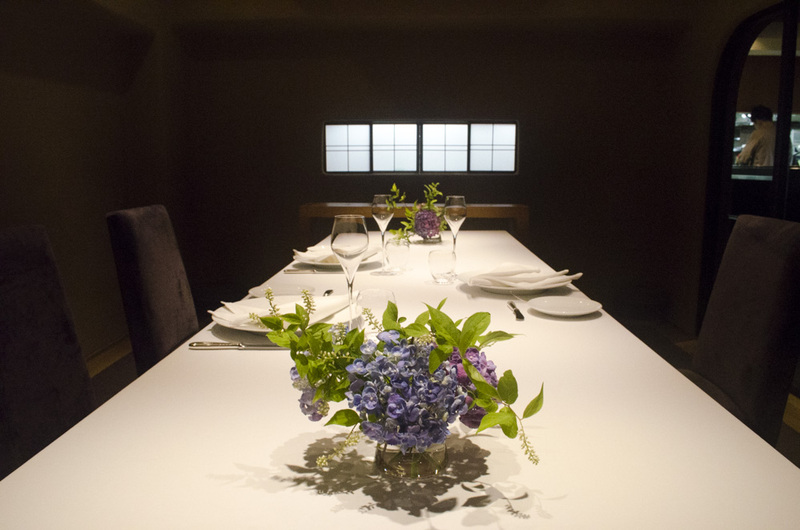 But, for more intimate events, a private room is available downstairs by the kitchen. With a two-star Michelin rating, the food coming out of this kitchen is superb. 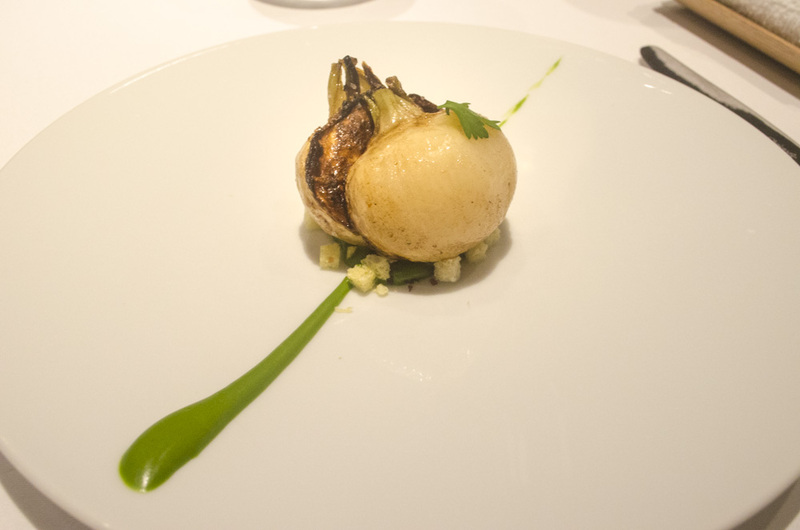 Each dish balances French technique with Japanese flavors. Many of the ingredients are locally-sourced and the staff are enthusiastic to share the origins of everything. “We believe in quality over quantity,” Head Sommelier Akio Matsumoto explained. He told us that L’Effervescence works closely with selected artisan farmers to ensure only the best ingredients. And the results show on the plate. Only one menu is available, a prix-fixe called “Terroir~ Where the Ocean Meets the Land”. This menu contains subtle, yet complex notes that tell a story of respect for the local environment and the artisans who nurture it. Ingredients are seasonal and the menu changes accordingly. When we visited, vegetables like white asparagus and bamboo shoots were in season. You can find a list of their partner artisans here. Requesting a vegetarian menu is easy. Simply notify the staff of any dietary restrictions when reserving. The chefs will then make substitutions so the menu suits you. Currently, the restaurant can accommodate pescatarians and ovo-lacto vegetarians. They cannot accommodate vegans at this time. L’Effervescence is open for lunch from 12:00 to 16:00 and for dinner from 18:00 to 23:30. Allot three to four hours for your meal. Reservations are required. Cancellations made within three days of the date are subject to a cancellation fee. The dress code is smart casual and collared shirts are recommended.